ONS’ GSS policy of best-fitting 2011 Census estimates (and other national statistics) from output areas has been causing issues for some local authorities that have seen ward boundary changes since 2003. SASPAC has received considerable interest from users on this particular issue as well as discussion on the StatsUserNet and Knowledge Hub forums. All 2011 Census ward estimates have been created using a method of best-fitting from the population weighted centroids of the underlying 2011 Census Output Area (OA). The population weighted centroid is a single point within the OA that represent the median location of households. The whole population of this OA is then assigned to the ward in which it falls. This means that where OA boundaries no longer match ward boundaries (i.e. they have changed since 2003 when the 2001 Census OAs were produced on an exact-fit to wards) the population/household estimates may not reflect all households physically located within the ward boundary. Conversely households outside the ward boundary may be included. using Census day address lists (e.g. Royal Mail Postcode Address File or the Local Land and Property Gazetteers maintained by local authorities) to distribute the population. Tees Valley Unlimited have very helpfully documented their approach here. Another approach will be possible when the 2011 Census Unit Postcode Headcount data (Postcode estimates tables are currently expected in May (p35 of the 2011 Census Prospectus (.pdf)) are published. These will provide details of the number of males, females and occupied households for each Census day postcode and will provide a very accurate method of redistributing the population to ward boundaries. Once you have created the improved OA population distributions, SASPAC’s rezoning tool can then be used to easily recreate all the Census tables for these more accurate ward household or population distributions. For more information in how to rezone in SASPAC see Module 4 of our training manual. Census estimates for other areas such as Parishes have also been best-fitted from whole OAs. This re-estimation method can be applied to any zones where best-fitted figures are insufficiently precise. Creating your own local ward estimates will produce alternative figures to those officially produced by ONS and should be documented and correctly labelled as such to avoid any confusion. Also, the best-fit methodology will be applied to create other ONS datasets, so care should be taken to use denominators created using the best-fit method. Download median population weighted centroids for output areas, super output areas and workplace zones in shp and mid/mif format. This entry was posted on Friday, March 22nd, 2013 at 2:14 pm and is filed under 2011, Data, outputs, Training. You can follow any responses to this entry through the RSS 2.0 feed. You can leave a response, or trackback from your own site. We are one of the local authorities where ward boundaries changed post 2003. 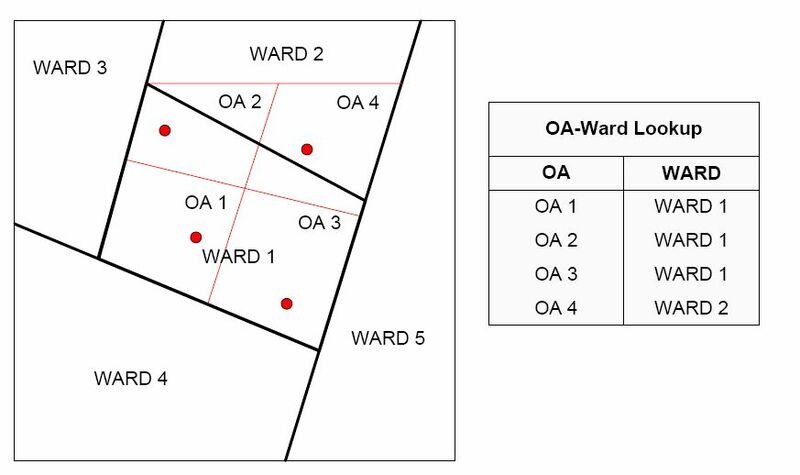 We were issued with a new set of 2001 data rezoned to 2004 best fitted wards (whole oa allocation). 2011 has seen many changes to OA geographies in Birmingham, most wards have been affected. We have seen a 2001 OA split into several parts and being allocated to two different wards in 2011. We have one 2011 OA which is a merger of 2001 OAs from different wards. In addition, even where there has been no geographical modification to some 2001 OAs, some have been allocated to a different wards between the Censuses. We have started to rezone 2001 data to 2011 ward geographies to analyse differences with 2004 wards (are you still with me?) We are also waiting for the headcount postcode data so we can confirm or not – population splits. Have you had queries from other local authorities about doing meaningful comparisons between 2001 and 2011 wards, putting the definitional changes aside. Or do you know of any local authorities in a similar situation that have compared ward data between the Censuses?